The magic of Lady Gaga's SAG Awards look — a modern-day spin on Old Hollywood glamour — was all in the details. At first glance, her ivory Dior Haute Couture gown seemed almost understated, but then you noticed the softly feathered stitching and hip-high slit that landed her at the tippy top of every best-dressed list. And her beauty look — a poreless matte complexion punctuated by golden and oxblood accents — was similarly stunning in its emphasis on the finer points. Take, for example, her fingernails. One look at her rich, glossy, deep-red manicure would have you thinking, like the gown and the diamonds, that Gaga's polish must be designer — maybe a pricy Parisian red by Dior, Chanel, or Yves Saint Laurent. But on the contrary, Gaga proved she's a woman of the people, wearing a fancy-looking nail polish that's actually just $8 at Target. Celebrity manicurist Miho Okawara partnered with Essie for Gaga's glam at the SAG Awards, using the brand's burgundy-red polish in the shade Berry Naughty — which proved to be the perfect complement to her white Dior gown. “Lady Gaga’s gorgeous white Dior dress called for a bold contrast," explains Okaawara. 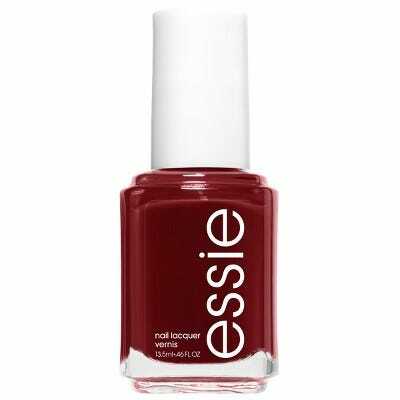 "We chose Essie in Berry Naughty – a creamy, deep berry." Not only did the shade pop against the white of the gown, but it was also an exact match to Gaga's lipstick of choice — a much more expensive combination of Marc Jacobs (P)outliner in Currant Mood and matte lip crémes in Blow and Dashing, all of which tallied up to $84. But Gaga taught a lesson in high-low red carpet fashion, finding an affordable polish to match the luxe lip. ""These subtle, unexpected touches helped to create the fashionable edge Gaga's so famous for," Okawara says. And while we may never wear custom Dior, a single $4,800 Tiffany & Co. True Narrow bracelet (Gaga wore four), or shop Marc Jacobs Beauty on the regular — we can afford to steal the shiny, rich, red carpet manicure with a $10 bill and a Target run.